Soviet APC in Baku during the week of January 20, 1990. Reza secretly took this photo through a car windshield because it was too dangerous to openly photograph the Black January events. Photo: Reza. On January 20 twenty-nine years ago, Soviet forces attacked the people of Baku, killing and wounding hundreds and illegally arresting many more. 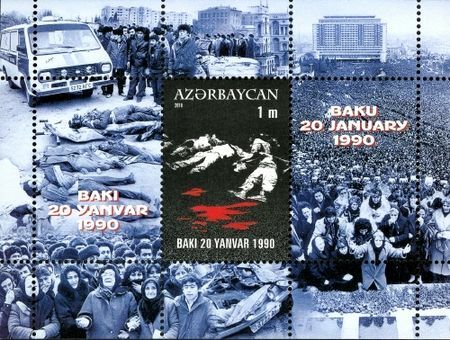 That date remembered in Azerbaijan to this day as Black January is less well-known to many now than the events in Vilnius and Riga a year later or in Moscow in August 1991. Soviet and Russian apologists have with more or less success sought to justify what Moscow did by pointing to the war between Azerbaijan and Armenia over Karabakh, but in fact, Moscow sent in forces to try to block the Azerbaijani people from overthrowing the communist authorities and installing a government responsive to the population. As such, it deserves to take its place as the time and the place the Soviet Union died because the powers that be in Moscow in effect invaded a territory the rulers claimed was their own and thus snapped any remaining ties of loyalty between the population and the Soviet imperial center. That is because, in trying to save that empire, Moscow showed that it had been reduced to relying on the use of massive and murderous force alone and thus it might act against other nations within the borders of the USSR in much the same way as it had done against the Azerbaijanis. For that reason alone, Black January should be better known. The chronology is complicated. In the weeks before Moscow invaded, Azerbaijanis tore down the border fences dividing them from the much larger community of ethnic Azerbaijanis in Iran, and the Popular Front of Azerbaijan took over many government offices around the republic. Then, on January 9, ten days before Moscow moved, the Supreme Soviet of the Armenian SSR voted to make Nagorno-Karabakh, the predominantly ethnically Armenian enclave in Azerbaijan, de facto part of Armenia by including it within the Armenian SSR budget and allowing residents of Karabakh to vote in Armenian elections. That outraged many Azerbaijanis, but they were especially angry Moscow did not respond to the Armenian action. And often employing “heavily anti-Armenian rhetoric,” according to Human Rights Watch, Azerbaijanis then called for full independence from the USSR and prompted the Popular Front to set up committees for defense of the nation. Azerbaijani officials were unable to gain control of the situation, and Baku directed the 12,000 troops of the Interior Ministry to stay in their barracks lest their appearance spark violence in the city. That led to a breakdown in public order in parts of Azerbaijan and to attacks on Armenians, many of whom appealed to the Soviet government to help them leave. The Azerbaijan Popular Front took control in many regions of the republic, and on January 18, it called on residents of Baku to block the main access routes into the Azerbaijani capital in order to block any Soviet forces that might be sent against them and its activists surrounded Soviet interior force barracks there as well. That led the Soviet officials on the ground to pull back to the outskirts of the city where they established a new command post to direct the Soviet response. That response was not long in coming. On January19, Mikhail Gorbachev signed a decree calling for the introduction of forces to restore order, block the actions of the Peoples Front, and prevent anti-Armenian pogroms. Almost immediately an estimated 26,000 Soviet troops entered the Azerbaijani capital. To justify their acts of violence which claimed at least 100 lives and perhaps as many as 300, Moscow propagandists claimed that Azerbaijanis had fired on them. But a subsequent investigation by a Russian human rights group found no evidence of that. Moscow worked hard to block information about what was going on from reaching the West or even reaching Azerbaijanis. It blocked power to Azerbaijani state radio and television and banned all Azerbaijani print media. As a result, the main source of news as the violence continued became the Azerbaijani Service of Radio Free Europe/Radio Liberty. Soviet forces occupied the city, but they did not break the Azerbaijanis’ drive for independence. Hundreds of Azerbaijanis turned in their communist party cards, and on January 22, after the Soviet violence had died down, the Supreme Soviet of the Azerbaijan SSR met and condemned the actions of the Soviet forces, hardly the response Moscow hoped for. Moscow’s Memorial Human Rights Society and Helsinki Watch were among the organizations which denounced these Soviet attacks against unarmed civilians and even ambulances. And with time, the world came to know what had happened in Baku, although these events never received the attention the far less murderous attacks in Lithuania and Latvia did. After Azerbaijan succeeded in restoring its independence at the end of 1991, Azerbaijani officials called for bringing charges against Gorbachev for his actions in January 1990, appeals that continue to be heard in Baku. And Azerbaijanis since that time have marked January 20th as the day of martyrs. First, even Russian leaders who some see as reformers have not been shy about playing the worst kinds of ethnic politics or using massive violence against non-Russians in pursuit of their own interest. In the years since Black January, Gorbachev did so in the Baltics, Yeltsin did in Chechnya, and Putin is doing the same in Ukraine. Second, Moscow has invariably tried to control the media environment in order to muddy the waters about what it is doing and to shift the blame away from its own repressive policies to the actions of others. That did not start with Putin’s “hybrid war” against Ukraine, however much some want to insist on that idea. And third – and this is especially important for Azerbaijanis to remember now given recent government actions against independent media outlets and human rights activists – it is precisely media outlets like Radio Liberty and independent organizations like Human Rights Watch that from the start have defended the Azerbaijani people. Nagorno-Karabakh: Who is to blame and who benefits?